The Corrsin Wind Tunnel is named after the late Hopkins professor Stanley Corrsin (left), who designed and built this facility to study fundamentals of turbulent flow. Many landmark papers in the field of turbulence (e.g. Comte-Bellot & Corrsin, J. Fluid Mech. 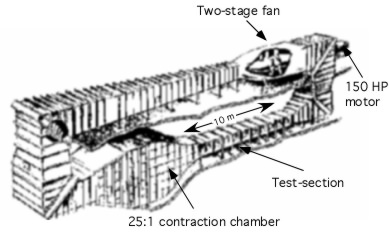 48 (1971), p. 273) are based on measurements in this wind tunnel. It is a closed loop, two-storey facility, with a primary contraction-ratio of 25:1, a secondary contraction of 1.27:1 (to enhance isotropy of turbulence generated downstream of a grid) and an approximately 10 meter long, 1m by 1.3m wide, test-section. Speeds of up to 32 m/s can be achieved. The laboratory is equipped with several multiprobe hot-wire and cold-wire anemometry and high-speed multi-channel data acquisition systems. 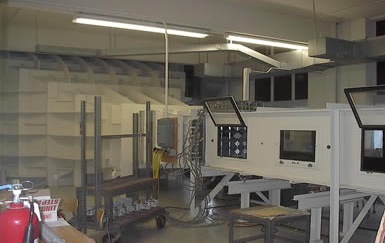 Also a stereo-PIV system with a large data storage system is available for planar velocity measurements. 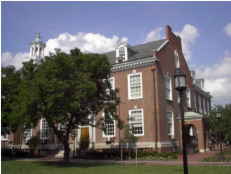 The wind-tunnel laboratory is housed in the basement of Maryland Hall of the Johns Hopkins University (shown at left). The facility consists of a 3.3 x 0.2 x1.27 m^3 water tank in which turbulence is generated by four high-speed rotating grids. 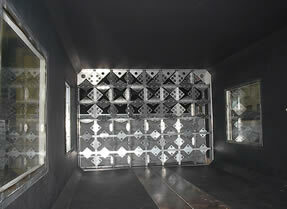 It was constructed by graduate student Jun Chen in a collaboration with Prof. J. Katz. 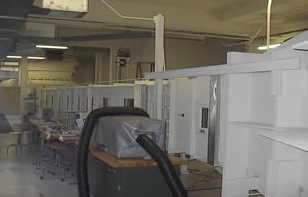 The facility is housed in the basement of Latrobe Hall (see photo at left), in the Laboratory for Experimental Fluid Dynamics. 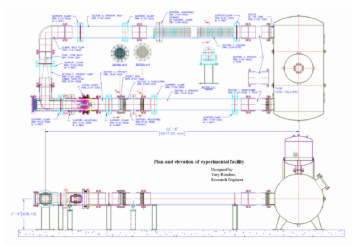 The figure below shows a functional sketch, and is followed by a rendering image of the facility. Turbulence with no mean velocity is generated by four symmetrically placed spinning grids. In the present facility the grids can be rotated up 1800 rpm, so we may possibly exceed u'~0.5 m/s and Rl ~ 600. The distance between the grids and the test-section is 63 cm. Turbulence diffuses towards the central test-section, setting up nearly isotropic homogeneous turbulence there. During the experiments, a piston with rectangular cross-section of 100 x 20 cm^2 is pushed from the top downwards towards the bottom of the tank, setting up a planar straining field there. The piston is driven by an Exlar linear actuator (GS-6010), which is controlled by an Emerson motion control system (MX-1600 power amplifier + AXIMA 2000 motion control unit), through magnification of a lever. 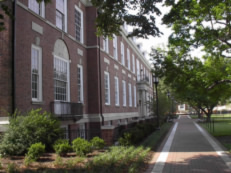 Former graduate student Jun Chen is shown next to the facility at right. Computational studies and large-scale simulations are performed on various platforms. In collaboration with Profs. S. Chen and J. Katz, a Beowulf cluster computer has been constructed in the fluid mechanics group of the Department of Mechanical Engineering at the Johns Hopkins University with an NSF grant for major research instrumentation. This cluster computer consists of 65 nodes of commodity personal computers. Each node contains 1GHz AMD processor, 512Mbytes memory and 20Gbytes hard-disk space. The Wulfkit based on Dolphin's high-speed low latency SCI interconnect technology is used to connect all processors which allows approximately 1Gbits/per second communication speed among processors. A 1Tbytes SAN is also included to provide large data storage. Each of the members of the Turbulence Research Group has at his/her disposal a PC running LINUX for smaller preliminary simulations and code development. Some calculations are also performed on the Departmental Silicon Graphics Power Challenge L (with six R8000 processors, 512 Megabytes of RAM and over 40 Gigabytes of disk space) and Origin workstations, and on National Supercomputing Centers such as NCAR's Supercomputing Center. 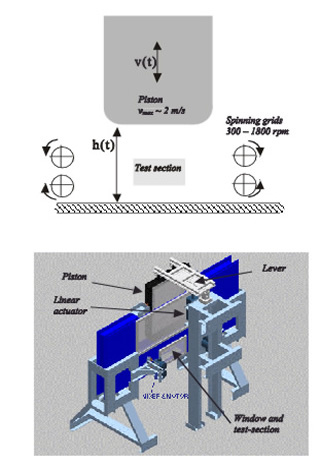 In order to provide full optical access to measure complex flow phenomena in axial turbomachines, a refractive index matched facility has been constructed in the Laboratory for Experimental Fluid Dynamics in a collaboration with Prof. J. Katz. The facility has been constructed with funds from12/13/2013 and ONR. The test section contains a two-stage axial turbo pump with rotor and stator blades that are made of transparent acrylic. Their refractive index is matched with a 62 % by weight solution of Sodium Iodide in water. The liquid has a specific gravity of 1.8 and a kinematic viscosity of about 1.08 x 10^-6 m^2/s (depending on temperature) which is almost the same as water. 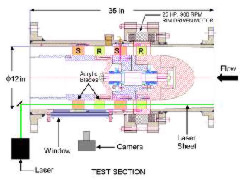 This kind of setup allows full optical access to the entire rotor and stator passages without the laser sheet being reflected, blocked or scattered. 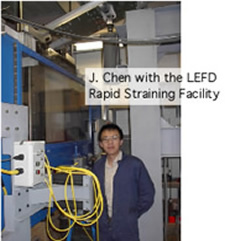 More details are given in the ~lefd web-site on turbomachine research. The drawing below shows a plan view of the facility, and the photograph that follows shows postdoctoral fellow Dr. Oguz Uzol (right) and LEFD graduate student Yi-Chih Chow (left) examining the optical setup.